The plan today was to get up early and visit the Grand Palace and Wat Phra Kaew (the Temple of the Emerald Buddha) before the day got too hot, then head back to Becca’s for a swim. I got up at 7 a.m., packed up my gear, had a quick breakfast, and headed out. 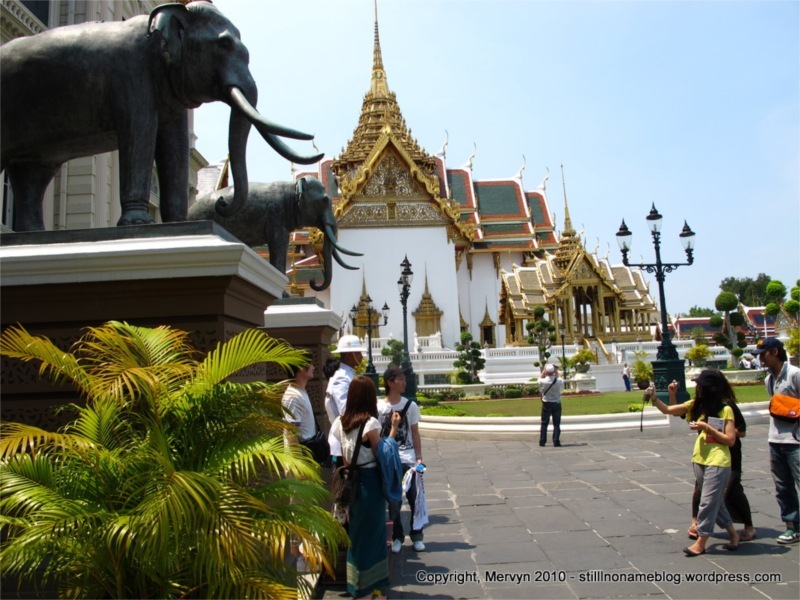 In my experience, Thailand is like the Philippines in that it doesn’t pay to be in a hurry. Not only does the heat and humidity punish you for walking quickly, public transportation runs on its own timetable (read: none). Come to think of it, San Francisco’s the same, too. 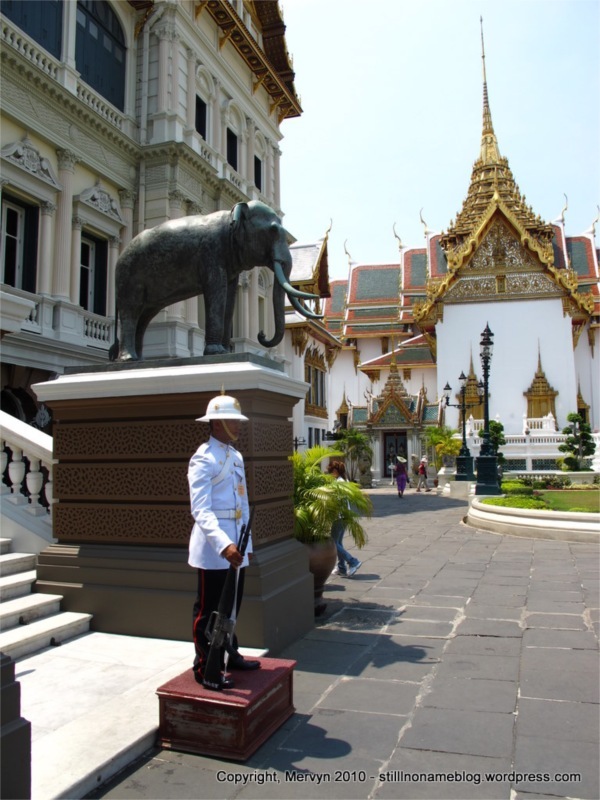 All that’s to say that between dropping stuff off at Becca’s and waiting for various trains, ferries, and water taxis, I didn’t get to the Grand Palace complex until 10 a.m. By then, the tourists were in full form. I joined the herd. When I was here in 2006, the tour guide our group hired rushed us through the place and didn’t really give us much of a tour. I decided that this time, I’d be more contemplative. A bit of background. 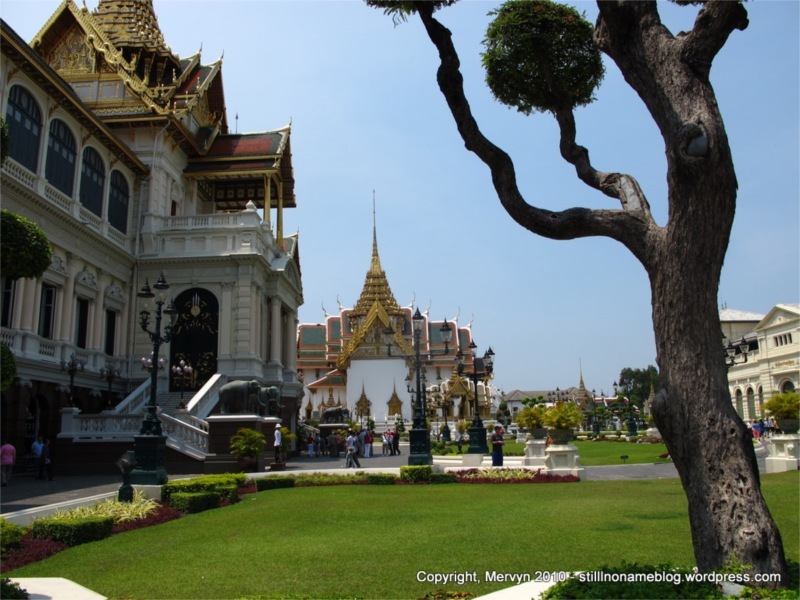 The Grand Palace complex houses Bangkok’s major tourist attraction, the Emerald Buddha. It’s also a Buddhist pilgrimage spot. 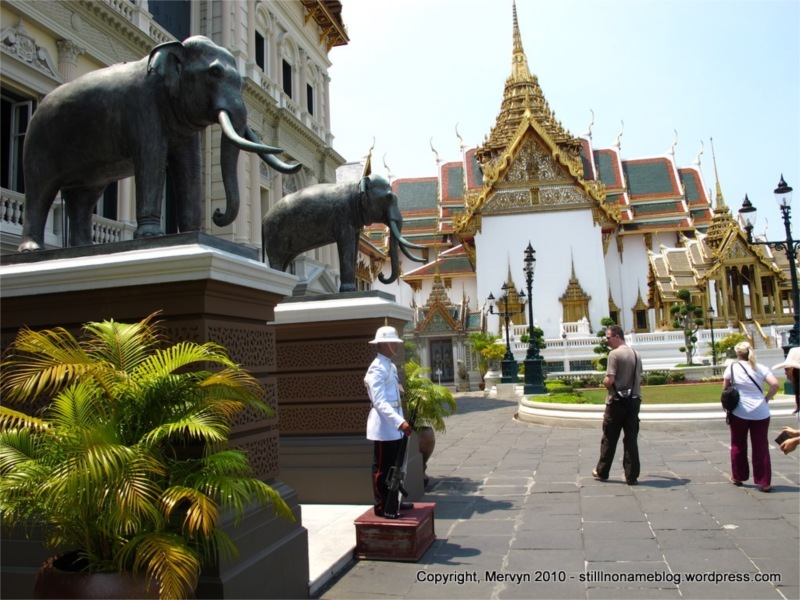 The ground was consecrated in 1782, the first year Bangkok ruled Thailand. There are over 100 buildings on the 95 hectare grounds. Some buildings are ornate, some plain, some sacred, some with royal significance, and some just offices that house government administrations. A few observations and random facts that I learned as I dorked it out with the camera. • I could have walked in without paying. I bought a ticket and when I got to the entrance I noticed a sign that said “For Thais.” I walked through that entrance just to see what would happen. No one looked at me funny. No one stopped me. No one took my ticket. I briefly considered scalping the unused ticket in my pocket, but thought better of it. I still had a bad taste in my mouth from my ONE DAY PASS experience. • I wish I’d gotten there a bit earlier because, by the time I arrived, the sun was high in the sky and the lighting for picture taking was pretty harsh. If I get a chance, I’ll come back right when the palace opens (8:30 a.m.). The dad called in my general direction, “Do you speak English?” I looked around because I thought he might be talking to a official guide looking person behind me or something. Nope. Turns out they’re Canadian. Oh, and they wanted me to take a picture. 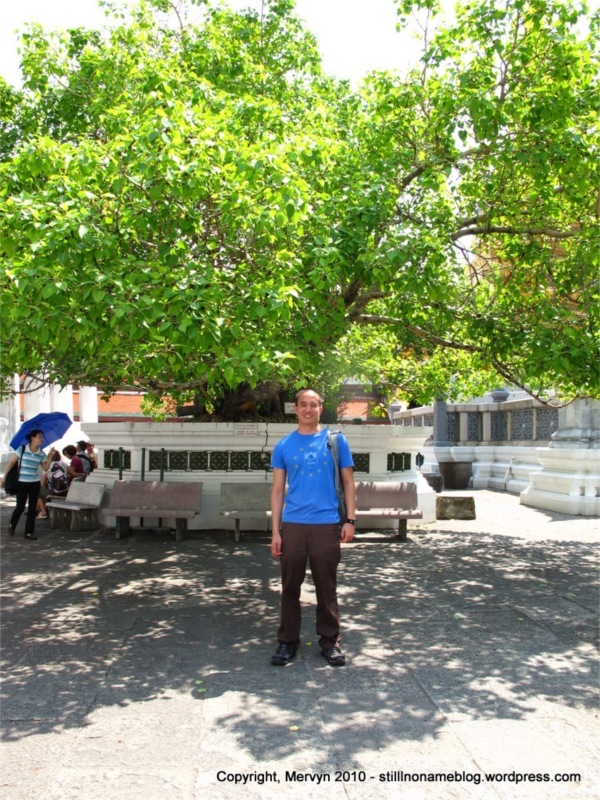 I snapped one of them under a tree that their guide had told them came from the original Bodhi tree under which Buddha obtained Enlightenment. They took one of me in return. No Enlightenment for me, just got sweatiness. 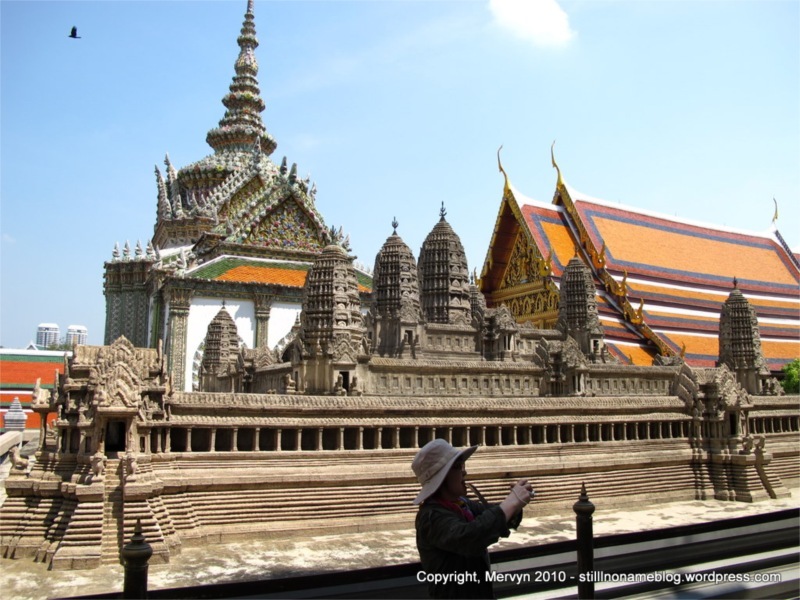 • There’s a large replica of Angkor Wat, a highly revered temple in Cambodia. 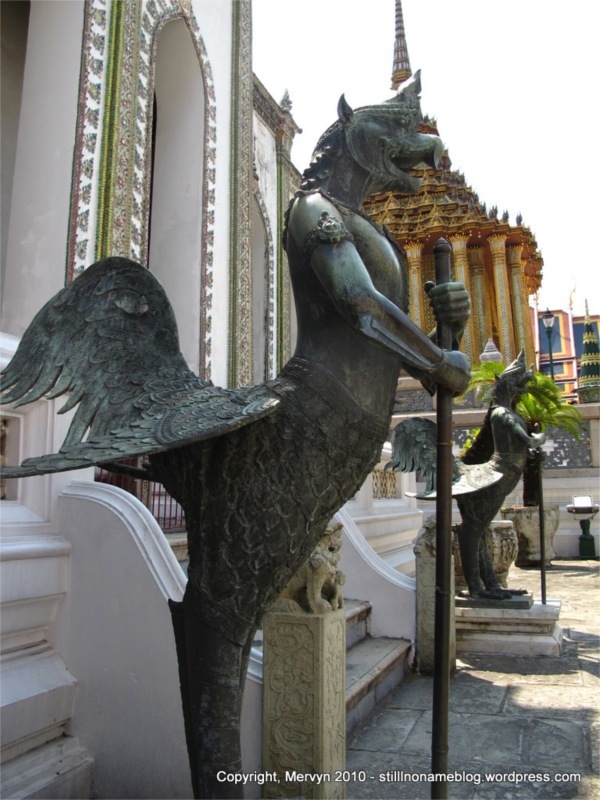 It was commissioned by King Mongkut (Rama IV). Nice of the king to go to all the trouble of giving me a preview of sites to come. • Cameras aren’t allowed into the most sacred or revered places in the palace. You can, however, take pictures from outside the door. 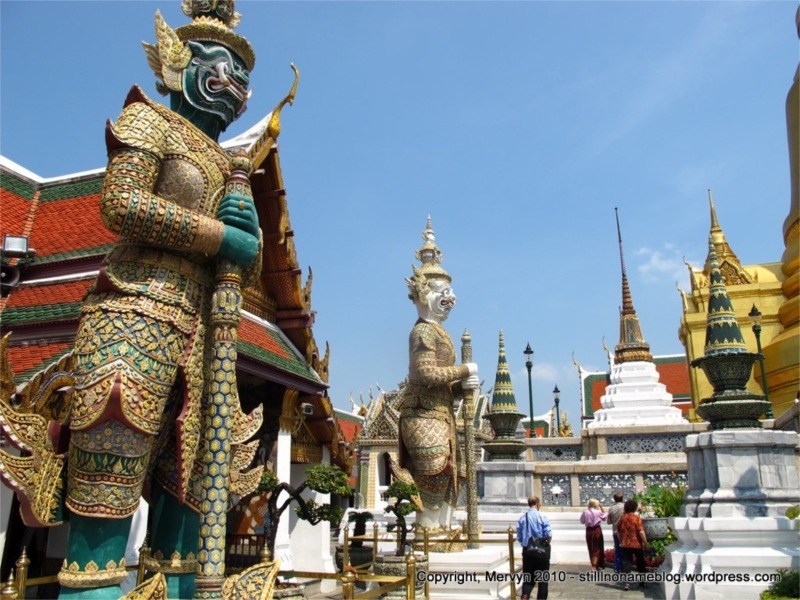 The Emerald Buddha is a special challenge since it sits at the back of a long dark temple, high above the ground atop an ornate throne. And the thing is only 2 feet tall. That means nearly every picture taken by a tourist is going to be a zoomed in, shaky thing that diminishes the grandeur of the experience instead of capturing it and inevitably leaves you wondering “Why didn’t he just buy a postcard?” Except for mine, of course. Mine was awesome. 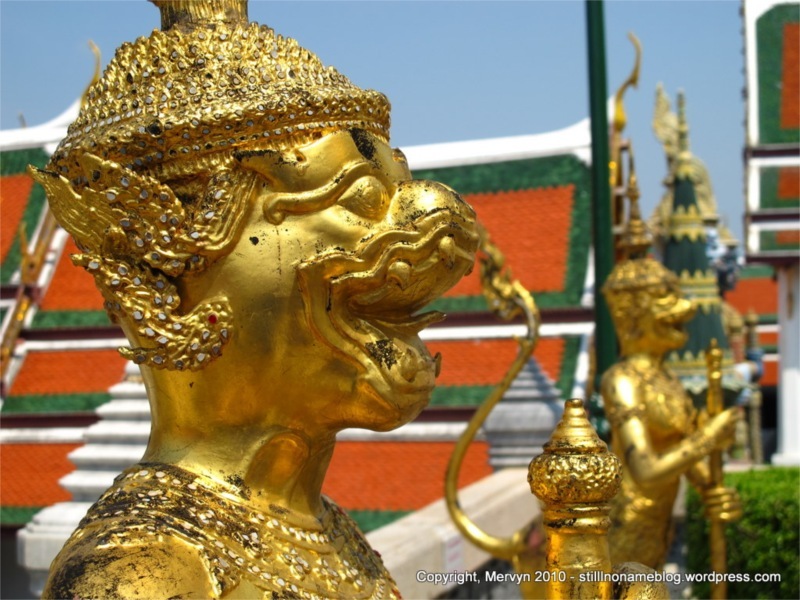 • Incidentally, the Emerald Buddha isn’t. It’s probably jade or jasper. The statue used to be an ordinary Buddha until the 15th century when, after a fall, a monk noticed that under the chipped plaster exterior was green rock. He thought it was emerald and thus the legend was born. Perhaps I can find a monk here who’ll mistake me for Brad Pitt. 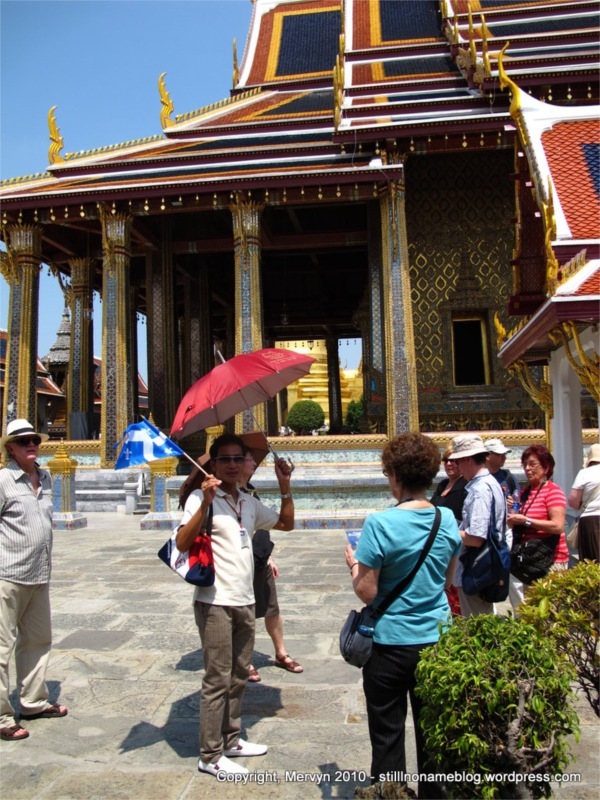 • There are Thai tour guides everywhere speaking every language on earth. I heard Chinese, Italian, Russian, Spanish, German, and even English. The guides seem to be pretty good, cracking jokes and making their groups laugh. You can almost hop amongst English-speaking groups to get a decent experience. Not that I’d ever do that or anything. 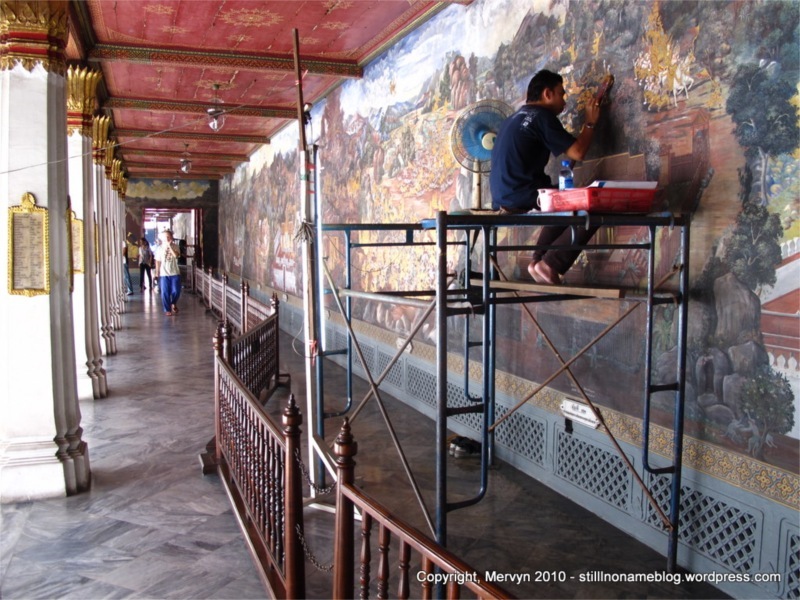 • The palace façade and temple murals are being restored. Same thing was happening at Wat Po when I visited a couple days back. These places must need constant work in the face of the corrosive heat and humidity. Sort of like Jerry Jones in the Texas heat. 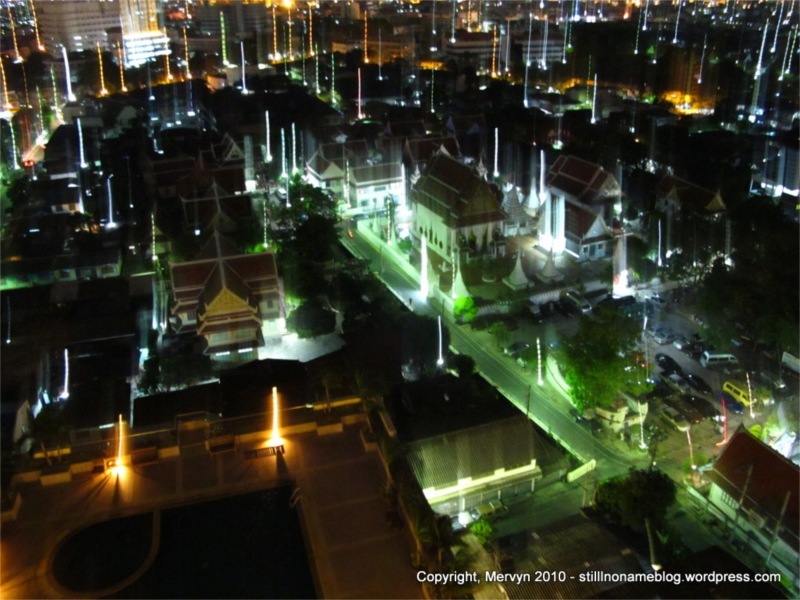 • The Chakri Maha Prasat was built in 1882, the year of Bankok’s centenary. The buildings are used mostly for state visits. It’s an interesting mix of Western and Thai architecture. 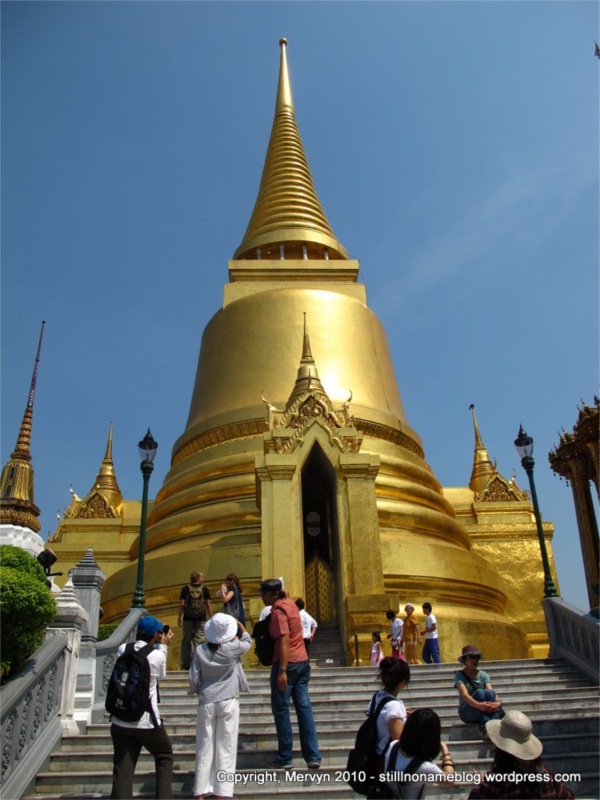 It was built by British architects using Thai labor. The bottom half looks Italian, the top half looks Thai. 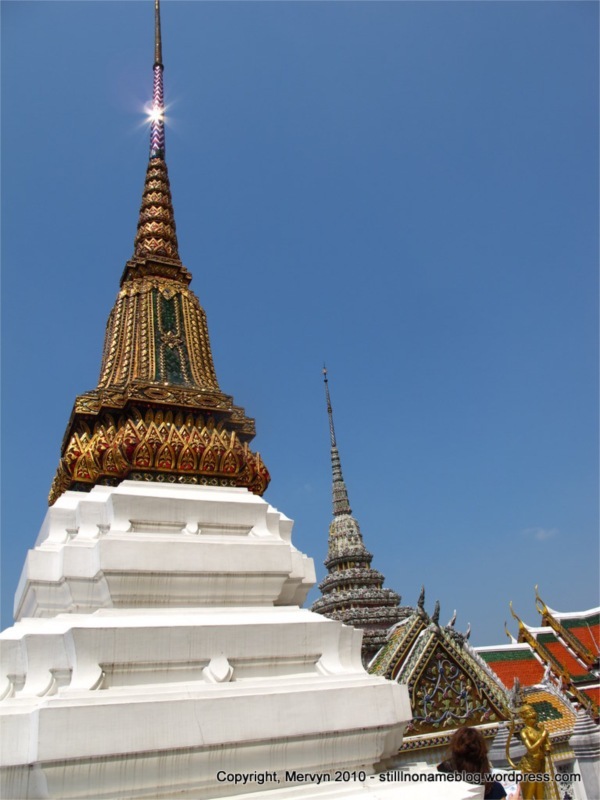 The central spire houses the ashes of Chakri kings; the princes’ ashes are under the smaller ones. The kings used to house their large harems in the inner palace area, which was guarded by battle-trained female sentries. That’s interesting and all, but I found myself enthralled by the tourists’ interaction with the palace guards. They’re like the stoic British guard at Buckingham palace, except they have to deal with stifling humidity year-round instead of just in the summer. Like their UK counterparts, they must endure the squawking, giggling tourists harassing them for pictures. It’s like being a celebrity, except no one gives a crap about your name and you can’t get them to stop even though you’re holding a gun with a bayonet. I finished up with the palace and took a series of boats back to Becca’s. As if to confirm my theory that Bangkok is a particularly international city, I met Ann, Becca’s childhood friend. Half Thai, half Swiss, she speaks English with a German accent. Besides English she speaks German, Thai, and I think a little French. She’s a chef who owns a small restaurant in a coastal village in the south. A village which she says is full of voodoo black magic. (She warned me to beware of the spell casting Thai girls if I visited.) She’s an outspoken red-shirt, shaved-head, lesbian smoker that swears like a sailor when she speaks English. I like her. I spent the afternoon intending to go for a swim. My intentions succumbed to a series of naps in the heat on Becca’s couch. When I finally regained consciousness, it was time for dinner. Becca’s mom had arrived, so Becca, Ann, and I headed out to the local outdoor market to grab food. 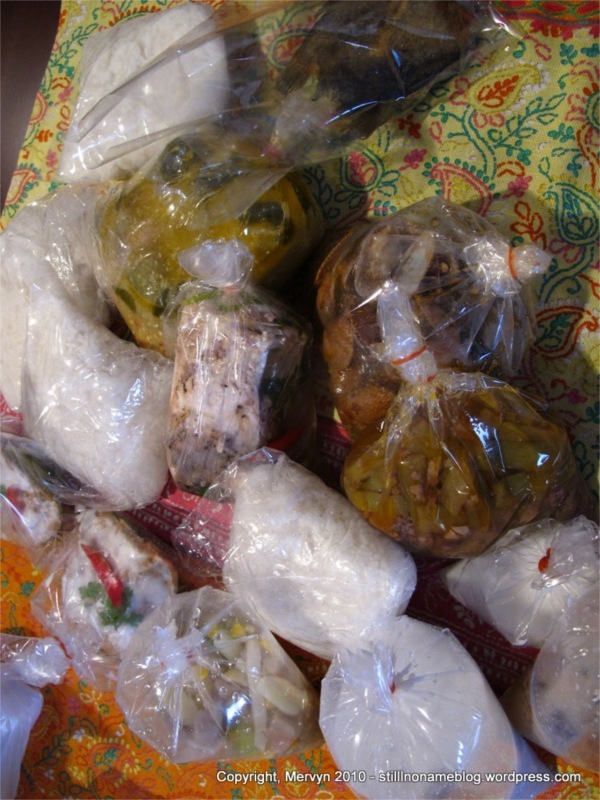 That meant tons of eats in clear plastic bags. Dried fish. Steamed fish. Fish and egg and vegetable steamed in custard-sized banana leaf. Steamed chicken marinated in fish sauce. Chicken curry. Clams. Grilled pork in soy sauce and onions. Some spicy salad thing with “fish gone bad.” I thought I was going to explode. Afterwards, Ann and I chilled on the balcony while she smoked and I messed with my camera taking pictures of the skyline. She ended up driving me back to the hostel in her Isuzu pickup (I didn’t realize Isuzus still existed). We may meet up Thursday to go to a fair that’s been set up near Chit Lom. That’d be guaranteed good times. 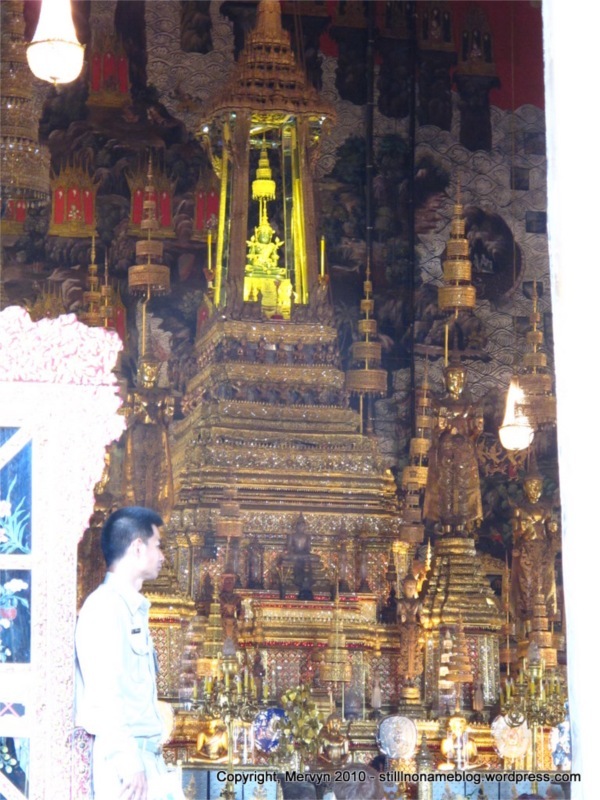 Stupid Travel Tip of the Day: Buy a postcard of the Emerald Buddha. 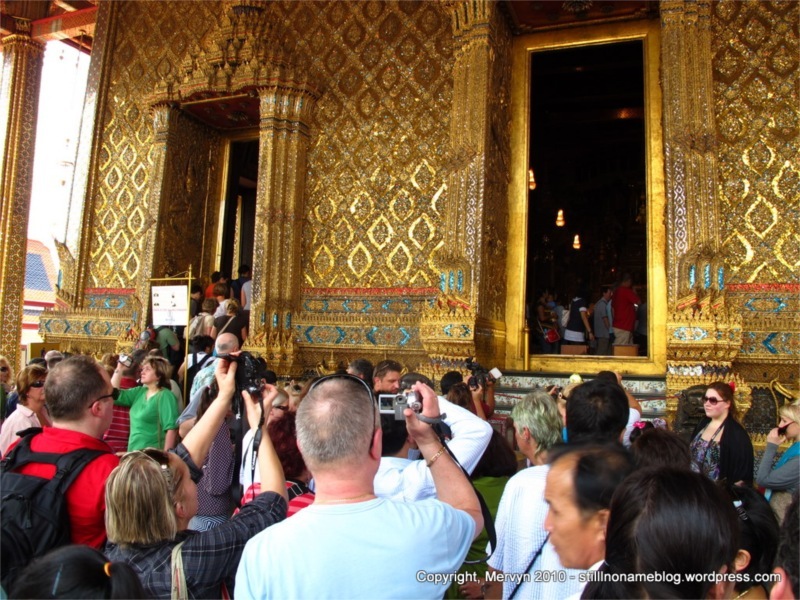 Not So Stupid Tip: Get to the Grand Palace early. It won’t be as hot and you’ll probably have better light to take pictures. There are also free English tours if you get there at the right times. I noticed that a few started at and before 10:30 a.m., with the next few starting at around 1 p.m. 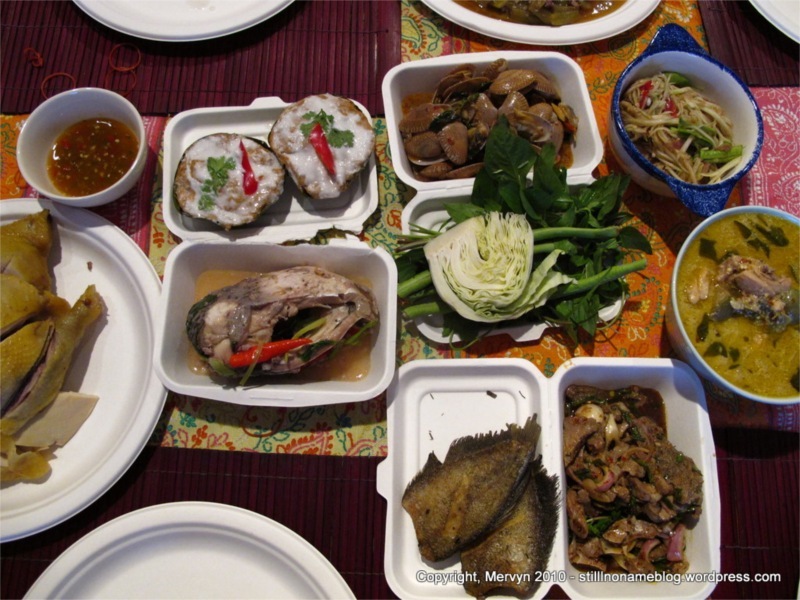 Afterwards, you can grab lunch at the market near Th Chang pier, the pier closest to the Grand Palace, then walk down to Wat Po and do the itinerary I suggested on Day 3.